What a wonderful creation. Saves time, does a great job. I don't know what other uses it has other than breaking up ground beef. If there are other uses, it would have been nice to have a directional paper included in packaging. If there aren't, it is still a great tool and I love it. works great and chops up ground meat sooo much faster than a spoon or spatula! This product is worth purchasing, it does the job well, I was surprised at how quickly the meat was separated into tiny little pieces. Great for taco night, and hamburger helper. I have used this several times to help cook ground meat for spaghetti and other things and it works very well it is very helpful and easy to use , easy to clean . Absolutely love the chop n stir. I've bought several of these for gifts. The feedback from them is LOVE IT!!! Alreade bought more as gifts. This utensil works great and I absolutely love it. Everyone should have this in their kitchen!! I used this product to loosen ground turkey. Turkey is usually the most difficult meat to separate, but this works really well. This chops up hamburger and sausage to your liking. I should have bought two. Please carry the black as well. If you use a lot of ground beef, you have to have this! I spent years breaking up ground beef with a spoon or fork,, this is awesome! Great for browning hamburg. It's the handiest gadget. I used to burn my fingers browning meat with a slotted spoon. Now I just chop and twist and the hamberg is perfectly browned. I was skeptical when I purchased this item. I used it for the fist time and it won't be the last! It chopped the meat just as it said it would. I may be making sausage pinwheels more often! Thanks for a great product! The Best new tool in my kitchen!! cook Bulk Sausage for Stuffing. It worked great for breaking up the lumps in the sausage. USE THIS EVERYTIME I COOK GROUND BEEF. IT CHOPS IT UP NICELY SO THAT YOU DON'T HAVE BIG CHUNKS OF MEAT. LOVE IT. The chopper is great for chopping ground beef and also solid albacore tuna! My husband and I both use this tool and we both love it!! We're really glad we bought it and you will be too, if you get one!! this is a great chopper,chops hamburg quick. My 12 year old daughter did not like to brown hamburger because it was "too hard". So I bought this for her, and she loves it. It makes chopping and mixing very easy. I use this product for chopping hamburger while cooking that way you don't have chunks of hamburger in your receipes. Chops Ground Beef Better Than Any Kitchen Tool. Buy, buy, buy! It's great! My husband does most of the cooking in our house, now, and he keeps raving about how great this tool is for evenly grinding up groundbeef for different dishes. I've never been able to make sloppy joes the way I want to before getting this tool. I use this for breaking up hamburger and/or sausage. It works great. My husband calls it the magic masher. Every kitchen needs one. Bought this because I have bad wrists (both hands). So, cooking ground beef with a spoon after a couple of stirs hurt. After trying this I love it. Use it for ground meats, egg salad, mixing salsa and more. Love it. I couldn't live without this tool. I use this to chop up ground beef in my frying pan. It is so much better using this for my hands because I have arthritis. 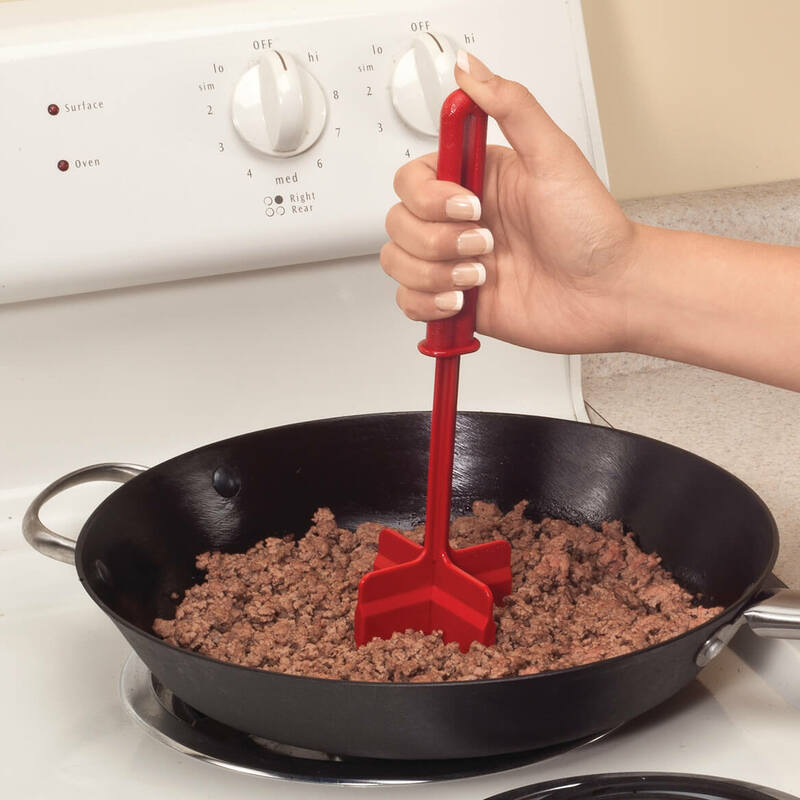 This makes chopping ground meats so easy. I can't believe I waited so long to order it! It even chops partially frozen ground meat in a few seconds. I'm thinking of buying more as gifts! I got this because when I fry up ground meat this breaks it up faster than any other tool I have in my kitchen drawer. Works wonderful. If you fry up ground meat you should have one of these in your kitchen too. I have used this item for many decades and have bought them for each of my children. They love them as much as I do. Unless you lose it or someone "borrows" it this will probably last a lifetime. I use it to break up meat, tomatoes any thing I want to break apart while cooking. Love it so much easier than a potato masher and easier to clean by far. This tool works great to brown ground meat. It chops the hamburger and stirs it much better than using a spoon. Unique design, easy to clean and dishwasher safe. Simple product but works well. This is my favorite utensil in the kitchen! I don't like big chunks of meat in my dishes so this tool is wonderful! It's a little noisy when using it but it chops the meat up so fine. Ground beef for spaghetti or chili, sausage for gravy or chili, it's a wonderful thing! It's heavy duty so it doesn't bend while chopping, it's dishwasher safe, it's a wonderful thing and I just bought one for my mom and she loves it also! WHEN I CAN COVER A BIGGER AREA WITH FEWER STROKES, I'LL BUY IT!!!!!! I'M ALWAYS LOOKING FOR EASY AND SWIFT!!!! I use this for mixing meatloaf, cooking hamburger in the skillet for soups or casseroles, helping to separate frozen chicken strips while heating up, making refried beans, etc. My daughter came to see me and said "Where did you get that????" She wanted one. My grandaughter came to see me and she said "Where did you get that?" She wanted one too. My grandaughter can't stand to squish meatloaf in her hands and before she got this tool, she always made her husband squish the meatloaf! Great item great for use with non stick pots and pans. Easiest way to brown your ground beef. Love this item. I used this stirrer to chop and stir hamburger meat for spaghetti. Worked great. The ChopStir cooking tool is amazing !!! We have already bought 3 of these, we are buying them for gifts. This tool is amazing, works perfectly. I loved the chopster when I used it at my sister's house at Christmas. It worked very well when I was browning pork sausage for egg casseroles. I liked the fact it went right in the dishwasher. Easy and convenient! I have arthritis in my hands and breaking up hamburger in skillet was so painful. This utensil does it so easily while it's cooking. I use it all the time and I love it. I notice some people think it should be sharper...it doesn't claim to be a knife. I bought it strictly for chopping ground beef while it cooks. A Neat Little Kitchen Tool! my nephews are the cooks in their household, taco salads and other meat preparation are their specialties. This will be a nice little tool for them to use. Not only do I use this for meat but I use it for mixing baking ingredients. It's great for cookie dough or anything else difficult to blend. This product is easy to use and saves time cutting up meat for taco's into the perfect size. mostly for my hamburger in the frying pan it is great! I recommend this chopper. I will be buying more! I've seen these choppers/stirrers on TV. I knew I had to get one when I saw it in the Miles Kimball catalog. I love it! It's much easier to chop my ground beef and bulk sausage in to much smaller pieces. I'll be ordering a few more for family members! Very sturdy. Does not bend. This product is perfect for breaking up frozen foods etc. I have used mine for years and I just ordered 2 for my daughters! We bought this product to use when cooking ground beef for sauces. It is so much better than using a spatula or spoon to break up ground meat. I recommend this product to anyone who cooks ground meat in recipes. Used the chooper the other night and was impressed at how it cut the hamburger up so fast and into small pieces. Its great. I use it to seperate hamburg while browning. I recommend ChopStir to anyone. GREAT! This is the best tool to mix and stir different foods. It's easy to use and easy to clean. I do not like lumps of hamberger or sausage in my food and this makes chopping it in small pieces easy, this has become my favorite utensil. THIS THING REALLY WORKS GREAT FOR CHOPPING UP MEAT AS YOU ARE COOKING IT. I use it to break up hamburger in most cases. It is also helpful in breaking up frozen foods. 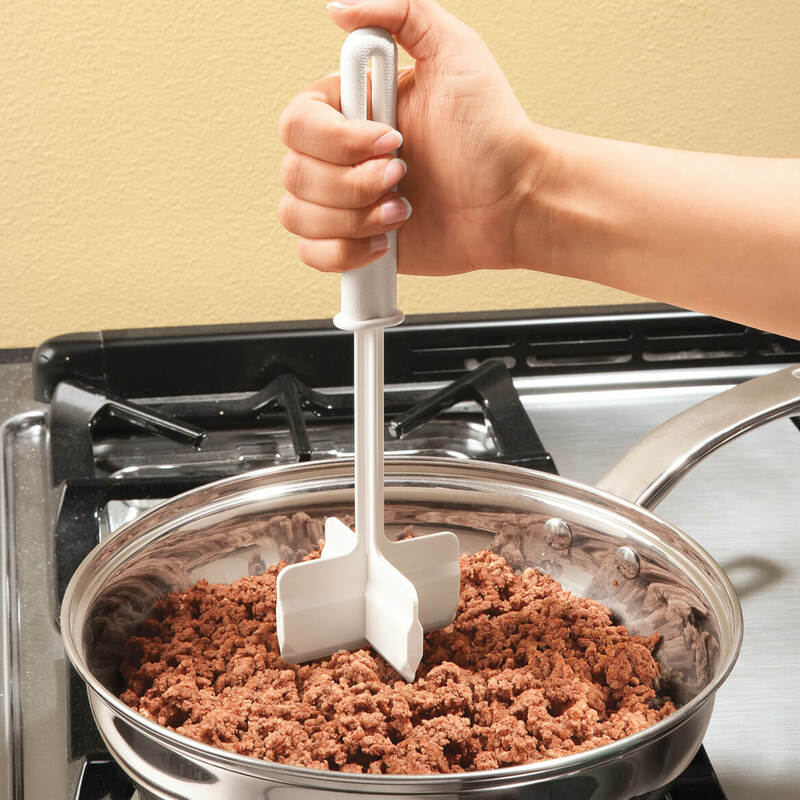 I brown a lot of ground beef, and this tool is a winner! Wish I'd bought it sooner. I bought extras to give as gifts. Easy to use. I bought this for myself and I love it. So much that I told my sister about it and she asked where hers was. So I decided to buy one for her. I also decided it would make the perfect present for our Yankee Santa gift giving next year. Thanks for all the little gadgets you guys sell. They are great. This nifty gadget is so nice to have around. I fix hot dishes once in awhile with hamburger. This gadget does a great job chopping up the burger - much better than using a spatula. Where has this been all my life? Saves time and energy when cooking ground meat. Use it all the time. I have searched for a kitchen tool to use to brown ground meats. This is it. Works perfectly. It's a new kitchen must have. This is a great addition to any kitchen..it is easy to use and crumbles ground meat to sausage to a fine texture. It is also good for crumbling pastry dough and hard boiled eggs, fine for egg salad sandwiches and a couple of chops for salads. I have some arthritis in my hands and it makes it difficult to chop up hamburger and other ground meats to a fine consistency, this tool makes my life so much easier. I have given these as gifts and they are appreciated by all. Very sturdy piece. I bought for myself and both my daughter and daughter-in-law insisted that I buy them one too. Great addition to my kitchen tools!! One of my favorite gadgets! I use this for ground beef and to make chunky guacamole. It works GREAT for both. Cuts each to the perfect consistency that I want. Have bought one for my sister and my daughter and they love it too. Used this to break up sausage that I was browning for Thanksgiving stuffing; made the job simpler and faster. I have wanted one of these for a long time and was glad to find it in your catalog. It does not scratch my teflon pans. This is a great product for chopping up and browning meat. I use it all the time now. I used it to break up hamburger meat and don't know how I have lived without it all these years. It is just wonderful. I dearly love this cooking tool!! I have arthritis in my hands and this tool is so comfortable to use. I made it big pot of sloppy joes, and chopping the ground beef was so quick and easy. I bought my daughter one and she loves it too!! Do you know how hard these are to find? I looked everywhere for one, every kitchen should have one! This gets the job done ! This product does what it says it does. I have given these as gifts and their first reaction is thank you what is it ? After they use it once they love it and you will to. I have used it and it,s great! It is so easy to use and does a good job in chopping frozen hamburger. I love this! I use ground turkey and it works perfectly. It is wonderful for any ground meat. It saves time and keeps your arm from getting sore from chopping with a fork, spoon, or spatchula. I am buying more to give out as gifts. I love this handy little gadget! It works just great to crumble hamburger when frying. My newest use for it was when I was cutting/blending butter into a pastry recipe, I couldn't find my pasty cutter. So, I grabbed my handy "ChopStir" and to my amazement, it worked awesome! So now I have a pastry cutter/blender too! I might just have to order a second one! I highly recommend this product! I use the ChopStir Cooking Tool for chopping beef and sausage for tacos, pizza...scrambling eggs. Just use your imagination...great for blending, too! This tool is just what I have been looking for. It replaced every annoying and inefficient tool I have in my kitchen to easily separate ground meats while they are cooking for tacos, soups, etc. This works great for chopping ground beef and for mixing other things. This is a GREAT tool for the kitchen. This is wonderful tool for anyone that cooks frozen or fresh ground meats. This is not a cheap piece of plastic, but holds up well to chopping frozen meat in the pan. I saw this tool in a very expensive "kitchen" shop, for a very pricey cost. When I seen it in the MK catalog, at half the price, I just had to have it!! I just ordered 2 more!!!! Whoever came up with this item should be given a medal!!!! I love using this to chop up meats or even pasta. It is easy to use then toss in the dishwasher. Worth every penny!!! I'VE WANTED ONE OF THESE FOREVER, WISH I WOULD HAVE GOTTEN ONE SOONER. WILL NEVER BE WITHOUT ONE AGAIN! I have arthritis in my hands and separating ground meat was such a painful experience. This utensil makes it so easy and no pain. I absolutely love it. I will buy it for my daughters as well. Great product. Purchased one for my sister. Recommend it to everyone. 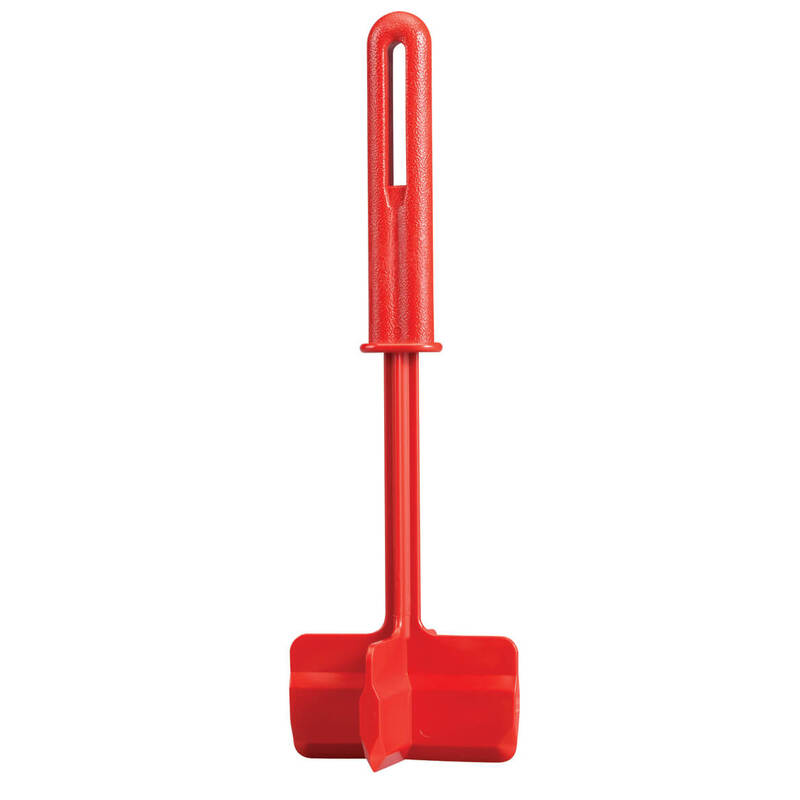 This ChopStir works good to chop up your ground meat as you are cooking it. What did I ever do without it? I use this to break up ground beef for Chile and on tomatoes for sauces. I have had this tool for a long time. My daughter-in-law had a similar one from Pampered Chef. She does not like hers because it is so hard to clean. I have really been happy with mine and recently purchased her this one. I think she will really like it a lot better. I wish I'd had this years ago! I have a sensitive stomach so must make sure my food is "mashed". This is an ideal tool. I bought one for myself and one for my daughter. She loves her's too. This makes chopping hamburger a breeze--much better than a regular spatula. I'm glad that miles kimball has this products, its something that I needed for some time. Thank you. My daughter has one and I like it better than using a spatula when cooking ground meat. The ChopStir is great for cooking hamburger loosely in a fry pan. This product chops the meat into a fine texture - great for taco meat or for a layered casserole. I enjoy using the Chopstir. I makes breaking apart hamburger so much easier & faster. I use it every time I cook hamburger, saves me time and makes my meals faster. It chops the hamburger as fine as I like. My daughter has one of these and I have looked everywhere for one. It is the most convenient and easy way to chop any type of ground meat product. The ChopStir makes breaking up hamburger in a skillet so easy. Twisting a large spoon to do this job really hurt my wrist and was tiring. I can use this tool without any wrist pain and the job goes much faster. And I no longer have large chunks of meat in my chili or other sauces. The texture of the meat is uniform. This is just like the kind you get at home parties at less than half the cost!!! How can you go wrong with that? I used the ChopStir to break up sausage I was cooking and it did an excelent job. I also used it to help chop up a boiled egg I was putting in tuna salad. Worked great! Did what I thought it would do. When I was making meat sauce for our pasta, I was able to make a nice sauce without chunky hamburger pieces in the sauce. Very happy with this product. I hated to pay the price for it, but I couldn't find it anywhere else, and now I'm the happy owner of one of the best tools around. Thanks, ingenious inventor! I use it to chop meat right in the skillet when I need it small. It doesn't mar the pan. Love my new gadget. Tonight I used it to break up chopped meat for browning. I will use it again to break up bulk sausage for browning. I used to use a long handled fork, but my hand would get tired - this gadget is so easy to use. This handy little tool chops not only chops hamburger but I used it for beef stew for vegetable soup. Just cook the stew until tender and chop for shred those large chunks. I saw this product in one of the Miles Kimball catalogs that I receive, and thought I would give it a try. I had previously made a meat spaghetti sause, and broke my spatula trying to break up the sausage and ground beef. This product was easy to use and really broke up the meat for a smoother sauce. Greatest thing since sliced bread!!! I have rheumatoid arthritis, but love to cook. Have been looking for something to help me with chopped meats. This tool is FABOULOUS!!!! Buy a dozen and give them to everyone you know!! When browning ground meat, this tool is great at separating the meat so that it browns easily. This is a must have in your kitchen. It breaks up hamburger and stirs it at the same time. It chops hamburger really nice for making taco meat. This item is near-perfect. It does a wonderful job of breaking down that huge block of ground beef that slides off the styrofoam dish into much smaller pieces. It is also very good at mixing the various chunks of beefs and making the pieces uniform. My only (small) issue is that at the end of the cooking process, I still need a wooden spoon to make sure that both sides of the beef chunks are adequately cooked. I bought one of these for myself and liked it so well that I bought another for my daughter. This item chops ground meats as finely as those you find in restaurants! Love it!!! I use it all the time when I make tacos it breaks up the meat in fine pieces. couldn't live with out it. All my daughters wanted one when they moved out on their own to use when they made tacos. I can't cook with out my chopping blade. I always use the chopper went chopping meat for a meal. I would not be without it. It is so easy to use. I was pleased with the idea of a red and a black colored tool because I like to use one for raw meat and the other one for cooked meat. At the time, the red one was on back order but I was told I would get it free of charge if I ordered it right away. When the red tool came, I discovered it came with a bill. In essence, this means I was charged twice for the same item. Today there are more items that I would like to order but since the bill for the red tool is still pending, I will not be placing another order until this situation is resolved. Makes chopping meat a quick and easy task. Necessary in spaghetti/sloppy joe meat cooking and breaks up tomatoe also ... stewed tomatoe. Get the black one. A must in my kitchen! My daughter has this utensil and I've searched for it for a long time. Glad I finally found it at a reasonable price. I wish it were balck instead of white for staining pruposes, but still love it! This little tool gets a lot done without a lot of fuss. I used to use a knife to chop up the meat and it scratched the pan. This works much better with no scratch marks. The meant is more uniform and cooks more evenly. I LOVE this product. It works like a charm. When I cook hamburg for a recipe I use this to break up the hamburg. I use to use a wood spatula to do it but it didn't work well. This is the greatest item. In fact, when I bought mine I bought 2 more for my cooking friends and they love it. Bought lots of these for Xmas presents. safe for teflon pans. Great tool! Must have tool for every kitchen! Makes cooking ground meat much easier to separate. Give you the ability to make small chunks or courser . Very easy to use for someone who has arthritis. This is a must have in any kitchen. If you need something in small or very fine pieces this is the tool to use. Canned tomatoes,any ground meats, and any number of other things are easily chopped in any pan.I give these as gifts to my family and friends and they love them.Very sturdy. I was skeptical about this item until I tried it. I am a handicapped person, always looking for gadgets to make life easier. I looked endlessly for something that would chop beef or turky meat while cooking in a skillet or frying pan. This is the best! Great tool. Worked great Christmas morning to chop cooked sausage for the breakfast casserole. Saves time, too. I use this any time I brown ground beef. When I found myself without a potato masher at our vacation home, it did a great job at that as well! Gave one to all my kids! Truth is I've had this item for some time, I recently ordered 1 sent to a dear friend, she is sold on it also. The only minus is while cooking food tends to stick some to the blades. really love this, so helpful when cooking hamburger meat or sausage in skillet. Cuts browning ground meat time in half. Now is the time to brown and freeze bulk sausage for holiday stuffing. This is great. Also for ground beef for chili. Used it for the first time when browning ground chuck for chili, it did a nice job, I was impressed, it's a keeper. 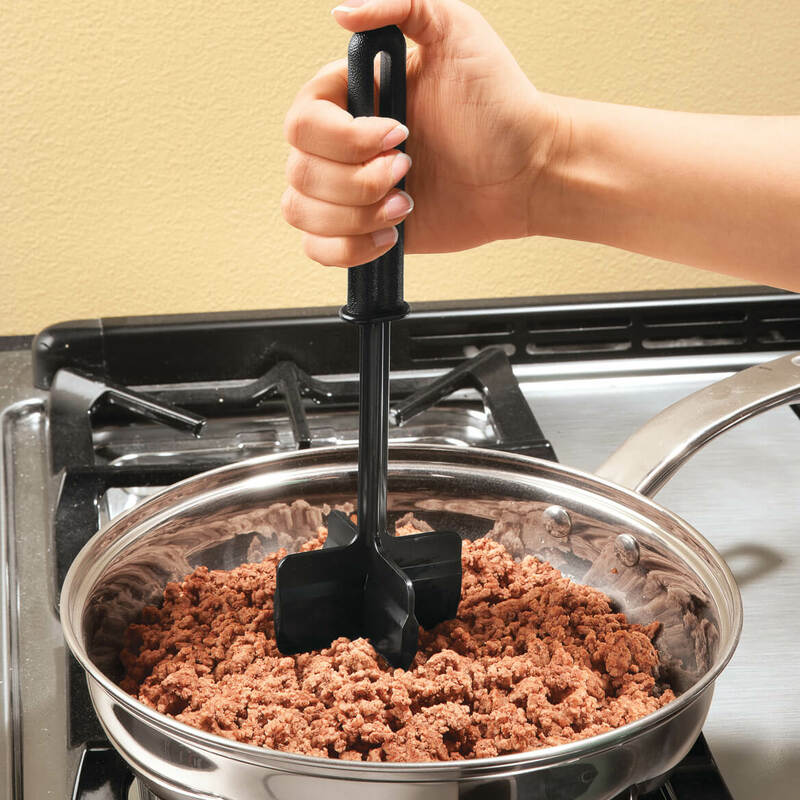 This tool is the perfect solution to cooking problem I have....chopping up ground beef that has been cooked in the microwave. I've struggled with mixing the "cooked on the edges while raw in the center problem" for years. I've tried a pastry cutter, different types of forks, and a food processor. This Chopstir is the best! I use it to chop hamburger at school kitchen and love it. I'm considering buying one for myself someday. It's a great tool to have around. I give it five stars. Great product for chopping ground meat for tacos, burritos, tomatoes or anything else that is a little bulky for stews, soups, tacos, etc. And you can chop right in the pan because it is safe for all finishes. Best gardet I ever bought. TRIED THIS AND IT WORKS WONDERFUL! Not only does it do a quick and easy job on ground meats,but I used mine to chop eggs for egg salad. I just love it. Getting one for a friend. I use it to break up canned salmon for salmon cakes. It makes the process go much faster and easier. I will try it on ground beef next. This is an excellent tool for the kitchen. It helps meat cook faster, breaking it up into more even piece's. I have given this as gifts and everyone loves it. This is the best tool for making finely chopped ground beef that I have ever found. I bought mine two years ago, then purchased two more for my daughters, then a pretty red one for my mother! I COOK ALOT OF MEAT SAUCE,THE CHOP/STIR MAKES CHOPPING HAMBURGER AND ESPECIALLY SAUSAGE INCREDABLY FAST AND EASY.IF YOU ARE 'SITTING-ON-THE-FENCE'ABOUT BUYING IT,DO NOT WAIT ORDER 2 OR 3. ONE FOR YOURSELF, THE OTHERS FOR GIFTS. It almost does the work for you. This chops ground beef very fine. It is also great in shredding chicken. I love it and bought a second one for my dad. I would get frustrated that I couldn't chop ground meat small enough for chili no matter how much I tried to get the meat chopped up to small enough consistency. This tool is exactly what is needed to do the job! It is also great for non-stick pans too because it won't scratch the pan. Would recommend it to people like me who want to get meat small chopped up. Haven't used it to stir yet. Have needed this item for a long time. It makes chopping ground meat a lot easier on my hands. I loved this so much I got my daughter one and she loves it too. It is easy to use and will not harm any kind of pot or pan! Best tool ever for separating ground meat in a non-stick fry pan - won't mar the surface. I have had one for several years and bought this one for a gift. Breaks up ground meat quickly, also works well to mix thicker batters. Meets the need for chopping food easily. ChopStir is just what I've been looking for for a long time. That it is easy to handle. Works great! I would recommend it. I've used this and wanted to share with others. Fast and easy and food gets cooked all the way through. This kitchen tool works good. Made browning ground meat easier. It makes ground beef a breeze to chop and cook into small bits. I use it for my specialized curried burger sloppy Jo's, brazing burger for homemade spaghetti sauce, you name it and if burger is involved it's a "can't do without" tool in my kitchen. Have seen this item at specialized parties, etc and it's very expensive...at Miles Kimble "The Price is Right" Thanks for an awesome product. This is much better than using a flat spatula! It's nice to be able to find a product that I can use with my non-stick cookware. So many 'as seen on TV' products are not all they are advertised as, this one is. Saves non-stick pans from metal utensils, always used a fork to break up hamburger before. This product works well in chopping up meat for a better more through cooking. I was always scratching my pans trying to cut up meat with spoons. Now this gadget works beautifully and no more scratches. Very good product. I've been looking for something like this for years. It was sturdier than I expected - which is great - yet it doesn't scratch my non-stick pan. Only drawback for me is that I can't flip the meat with it, but I think I'll get a better handle on that the more I use it. Used this for the first time the other day and it def makes a difference when trying to break up chop meat for chili, sloppy joes, tacos, etc. Made my life so much easier. I bought the chopstir to make chopping my ground beef easier. This is exactly what this product did. The only problem I have is that the handle is too short, if you chop vigorously the grease splashes up. I just go slower when I chop. Chops up ground meat very easily. This is one of those tools that you never knew existed, but would be lost without. Great time saver in kitchen. I like to cook but don't like to thaw the hamburger for long periods. Just cook it. Great for breaking up any ground meat. I have 2 and I bought 6 for Christmas gifts - everybody loved it. I use this for breaking up hamburger, sausage, or any kind of ground meat for different meals that require finely chopped meats. Works great. You can select your meat sizes from bite size to spoonful size. You can also size soft vegetables. Use to crumble ground beef, dice tomatoes, etc. It is much simpler than trying to use another kitchen tool. Great gadget for the kitchen or wherever! I like the plastic blades for breaking up hamburger. I do wish the handle was longer for us "short-armed" people! Works good to chop ground meat as it's cooking. Works good to stir pancake batter. You can't chop anything very solid w/ it. Kind of big handle to hold. You use this product to ground meat. You still need to use the spatula to chopp the meat down. I PURCHSED TWO OF THESE SOME TIME AGO AND HAVE USED THEM QUITE FREQUENTLY....AFTER USING MANY MANY TIMES THE BOTTOM OF THE BLADES DO GET SOMEWHAT DISCOLORED AND NOT AS SHARP. IF YOU DO NOT CLEAN THEM BY HAND CHANCES ARE, IF THERE IS ANY MEAT, ETC. STUCK ON THEM, THE DISHWASHER WILL NOT TAKE IT OFF. HOWEVER - - I CONSIDER IT A SMALL PRICE TO PAY FOR SPEEDING UP THE CHOPPING OF GROUND MEAT FOR BEEF BURGERS AND THE LIKE. SPEAKING OF PRICE THOUGH - - I DO THINK THEY ARE A LITTLE OVER PRICED, BUT WILL PROBABLY KEEP BUYING THEM JUST BECAUSE THEY REALLY DO WORK QUITE GOOD. My son was the one that wanted something to chop hamburger with. I bought 3, one for myself one for my daughter and one for the son. When my son opened it he had a very funny look, I told him he wanted it, still confused I told him and he was excited to see how it works, my daughter also. I think it is ok, I like my hamburger smaller when making things like chili. Having arthritis I was in hopes it would make chopping hamburger easier, it will take some time to get used to, but I do think it would do the job. This is a very good procuct to break up ground beef into small pieces to make any dish. It can also be used to chop some vegetables. I really enjoy using it. I love this kitchen gadget! I bought my first one and instantly fell in love with it. It works great!! I love that it makes my hamburger chopped into uniform pieces and fine. I use it on ground meats, vegetables, fruits, just about anything you want to chop up. I have given this a gifts and have been asked where I got it so my friends could give them as gifts. Tried to use it to chop ground beef, ended up using a fork. Let my son-in-law try it, he didn't like it either and ended up using a spatula. I will probably put it in the next garage sale. In Theory Looks Good, Sounds Even Better; Reality-WRONG! With this product, I'd hoped I could replace the old, wavy, metal potato-masher that was a hand-me-down from my mom's kitchen, that was used to break up fried beef & venison burger. From the write-up and photo in the catalog, this tool seemed "just the thing". After giving it every benefit of every doubt, it ended up in my donation box. I continued to use my 'old' metal tool gingerly, then finally found a coated masher(of the same style & of which, I bought 2) & have been happily using them ever since. My pizza and spaghetti meat has just the right size and uniformity, and is as perfect as it used to be using "Mom's Masher". I'd been a loyal Kimball consumer for years before this experience; this will not change due to one bad experience, which is easily outweighed by the many years of wonderful service and professionalism I have always received from the Miles Kimball family. loved it, also burned on my stove. Anything that makes my cooking easier I love. It will make cooking pasta much easier. Why not. Better than using a fork to chop up the hamburger for spaghetti sauce. Need one for my daughter. She loved the one I already have. to break up half frozen meat and veggies. Hopefully, this will save time chopping up hamburger and sausage meats for spaghetti sauce. I WOULD BREAK UP MY GROUND BEEF WITH A WOODEN SPOON. THIS UTENSIL WILL BE VERY HELPFUL. Ease of hamburger meat breaking down into uniform pieces, therefore uniform browning. It will help when cooking ground turkey. Will no longer have to break apart. Had one before it was great !! Bought one for my daughter !! I have one and love it. I have already gifted 4 others and they all love them. They are a GREAT handy tool. No more flipping hamburger over ...just keep stirring. I'm elderly and thought it might be easier to use than a wooden spoon. Two other people I know have this, and they love it. Efficiently chops Hamburg into smaller useable pieces. i see its use on a lot of cooking blogs. I have one for my home and I love it. So much easier breaking up browning meats than a fork or spatula. I got this one for at my friends house. I seem to do the cooking there, and I felt he needed one too!